Signed and dated l.r., red oil "SID LONG 94". Signed l.r. corner, red oil "SID (illeg.)". Deborah Edwards, Stampede of the Lower Gods: Classical Mythology in Australian Art , 'The Antipodean Arcady / 'When Pan purloined Apollo's lyre'', pg. 8-31, Sydney, Sep 1989, 11, 20 (colour illus. ), 31, 63. Bruce James, Art Gallery of New South Wales handbook , 'Australian Collection: Painting and Sculpture', pg. 102-181, Sydney, 1999, 117 (colour illus.). James Green de Libra, Australasian Art Review , 'The poetry of our painting', Sydney, May 1899, 25. Mark Matheson., Heritage , 'By Tranquil Waters', Sydney, 1995, back cover. Denise Mimmocchi, Australian Collection Focus: Sydney Long - Pan , 'Sydney Long: Pan', pg. 1-12, Sydney, 2009, 3 (colour illus. ), 5, 6, 7,. Denise Mimmocchi, Australian Symbolism: the art of dreams , ‘Sydney Long: Arcadian myth and the decorative landscape’, pg. 110-122, Sydney, 2012, 110, 111 (colour illus. ), 126. 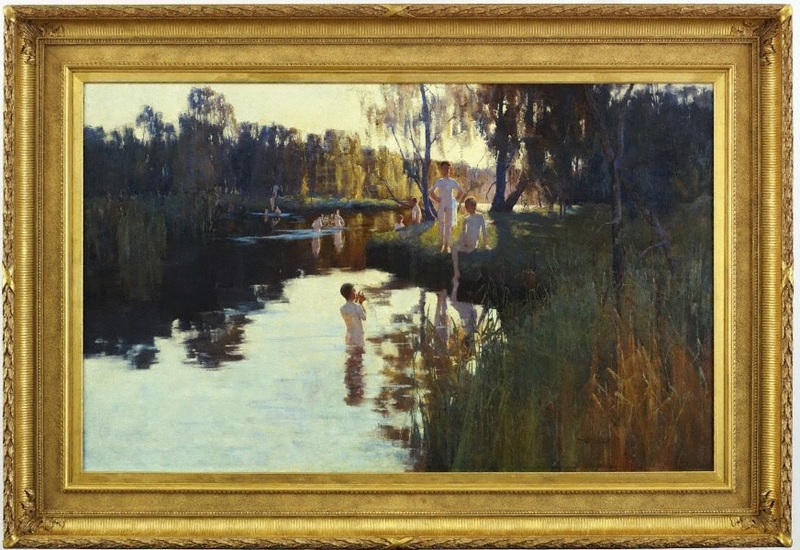 Joanna Mrendelssohn, Brought to Light: Australian Art 1850–1965 from the Queensland Art Gallery collection , 'Dancing across the Landscap. Sydney Long Spirit of the Plains', pg. 76-80, Brisbane, 1998, 76. A catalogue of Australian oil paintings in the National Art Gallery of New South Wales 1875-1952 , Sydney, 1953, 125. Now came still evening on , Sydney, 1941, 117. Art in Australia [series 3, no. 70] , Sydney, Mar 1938. Art and architecture , Sydney, Mar 1905, 63 (illus.). Bulletin , Sydney, 06 Oct 1894, page unknown. The Sydney Morning Herald , Sydney, 29 Sep 1894, page unknown. Daily telegraph , Sydney, 29 Sep 1894, page unknown. The Sydney Morning Herald , Sydney, 28 Sep 1894, page unknown. 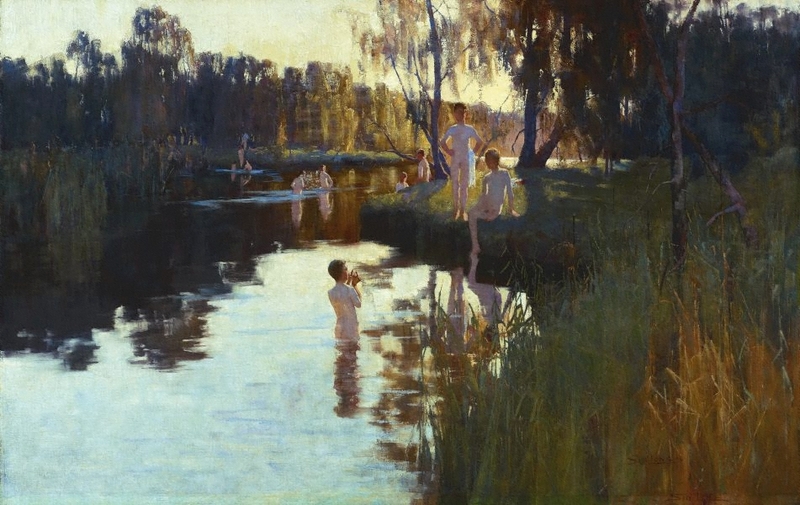 The Sydney Morning Herald , 'Art Society's exhibition', pg. 3, Sydney, 28 Sep 1894, 3. Art Society of New South Wales Fifteenth Annual Exhibition Catalogue , 1894, 26 (illus.). Trustees of the Art Gallery of New South Wales: Minutes 1.9.1891-4.5.1898 , Sydney, 1891-1898, 128. 26 September 1894 - A meeting of the Trustees was held at the Art Society's Exhibition rooms, York Street, at 11am. The purchase of 'By Tranquil Waters' was decided upon at this meeting. Look , ‘Contents’, pg. 9, Sydney, Sep 2012, cover (colour illus. ), 9 (colour illus. detail), 11, 24 (colour illus. detail), 25 (colour illus. detail), 26 (colour illus. ), 27, 28. Illustrations on pg. 24 & 25 are of conservation treatment. Look , 'Members events: November 11', pg. 47-49, Sydney, Nov 2011, 47 (colour illus.). Missing jigsaw pieces: the bushplants of the Cooks River Valley , Sydney, 1999, front cover (colour illus.). 1890s: aspects of the gallery , 'The purchase of Sydney Long's 'By Tranquil Waters'', Sydney, 1986, 4 (illus. ), 5. Art and Australia , Sydney, Dec 1977, 176 (illus.). Australian painting 1788-1970 , South Melbourne, 1971, 102, 103, 176 (illus.). Impressionist painters 1881-1930 , St Kilda, 1971, 26 (illus.). The art of Australia , Melbourne, 1970, 79.